Human attention can be attracted to many different things. Our thoughts affect this process: If we see a picture of humans, we tend to be attracted to faces. But if someone asked us to judge their fashion sense, we might instead look at their clothes and ignore the faces. These cognitive factors are usually referred to as top-down effects, because they are thought to originate in the cortex, and flow downstream from there to bias the visual system. Another very important factor that drives human attention and eye movements are low-level visual features. Specifically, humans (and other animals!) tend to be attracted to things that stand out: edges (lines in a drawing), areas of high contrast (stars in the night sky), odd colours (a black sheep in a see of white ones), and movement. These factors are usually referred to as bottom-up, because they originate from how our visual system works, and are relatively unaffected by our thought. The term saliency has been used in different contexts, but tends to mean “interestingness”. 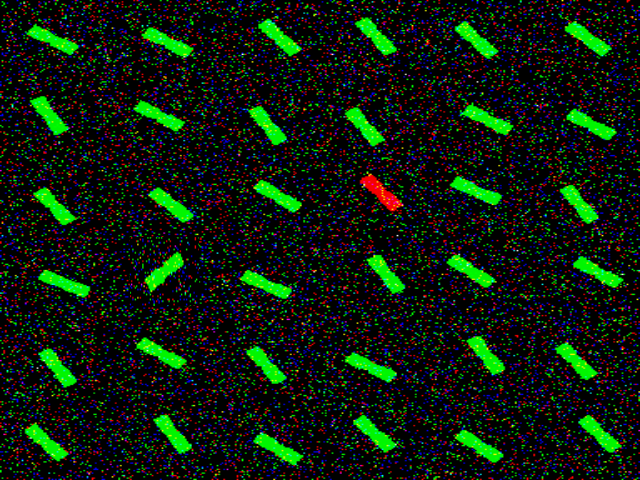 For example, green squares on a black background have a high saliency, but the one red square among them has an even higher saliency. In addition, a square moving through an otherwise still scene is very salient. Perhaps the most influential computational model of human attention through saliency is the model introduced by Itti, Niebur, and Koch in 1998 . Their initial model focused on static images, in which three factors drive saliency: intensity, colour, and orientation. In later papers, they added two more factors to quantify saliency in dynamic videos: flicker and movement. Colour: Colour perception is very complex. It starts in the eye, where the retina contains four different types of colour-sensitive units. These include three cones, each sensitive for a different wavelength of light: short, middle, and long (sometimes referred to by the colour they are most sensitive to: blue, green, and red). These cones are what drives most of our colour perception. (The fourth unit is light-sensitive ganglion cells, who respond most strongly to wavelengths in the blue area. These are important for maintaining our day-night cycle.) Further in the brain, these colours are combined and contrasted in populations of brain cells that could be sensitive to a wide variety of things (colour, intensity, a combination, etc). Much is unclear, but we tend to think of the result as a space in three axis: Luminance, red-green, and blue-yellow. Therefore, Itti and colleagues’ models include both red-green and blue-yellow contrasts. Flicker: This concerns rapid in-place transitions in luminance. For example, a strobe light flickers, and would thus be picked up in this channel. Movement: The visual system of very many organisms is sensitive to movement. Neurons are wired together in complex ways to be activated when edges move across their receptive field (the small part of your vision that they are interested in). These receptive fields can be small to pick up subtle movements, or very big to pick up movements that sweep across the visual field. A lot more happens in the model, including several steps of normalisation, and competition between the most conspicuous/salient parts of each image. For more info, please do read the paper by Itti and colleagues. You can find the full reference on the bottom of this page. Below you can see what happens if the saliency model is applied to an image with bars. In this image, one bar stands out because of its red colour, and one because of its orientation. The model does indeed pick this up, and in the different conspicuity maps you can see how the orientation channel picks up the green bar with the odd orientation, and that the colour channel picks up the red bar. Saliency/conspicuity maps of the stimulus array, pure (bottom row) and as weighted stimuli (top row). To illustrate how the saliency model deals with videos, I applied it to some Taylor Swift music videos. I found the videos on YouTube, where they were generously shared by Taylor Swift and her colleagues. All rights to the original videos of course remain with them, and I do not own any of the rights to them. I just hope my saliency-mapped versions will stay up! Itti, L., Koch, C. & Niebur, E. (1998). A model of saliency-based visual attention for rapid scene analysis. IEEE Transactions on pattern analysis and machine intelligence. 20 (11), p. 1254-1259. Your youtube video has been claimed by UMG. I’ve seen it before and it was a really interesting video, maybe you can reupload on Vimeo?